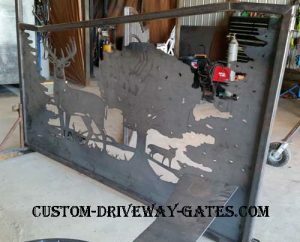 plasma cut gates Archives - Custom Driveway Gates - Iron Steel & Aluminum - JDR Metal Art - FREE Standard Shipping! 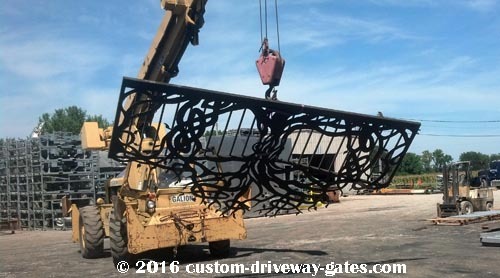 These Maryland driveway entrance gates were custom built by JDR Metal Art. 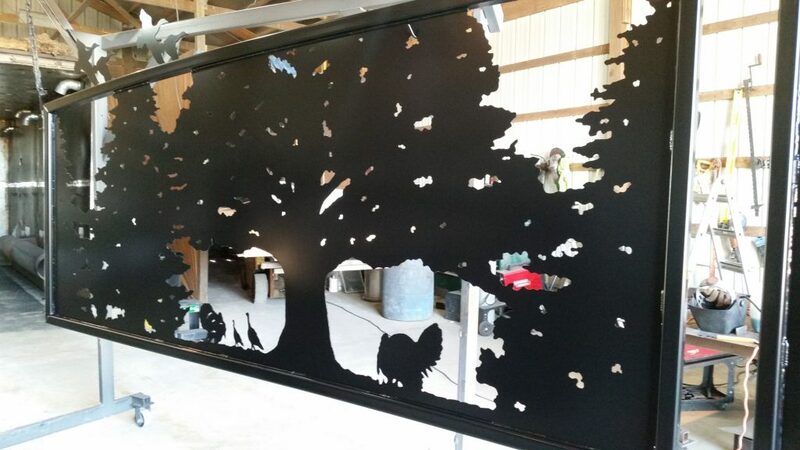 These beautiful plasma cut metal art Kentucky driveway gates were handcrafted for our clients in Louisa. 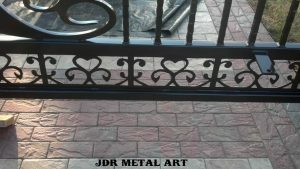 Our clients are finishing completion of their new homes and decided to contact us to help them get a custom gate design. 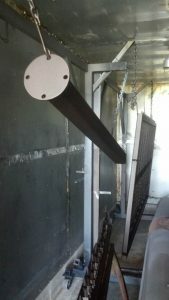 Here are some pictures of the gates in the shop while they were in the process of being constructed and powder coated. With over 6,000 powder coat colors available there are so many options when it comes to choosing the color for a driveway gate. 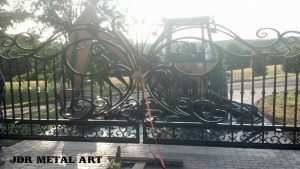 These gates are coated with a three layer powder coat system. They were first sandblasted free of rust and mill scale. Then a layer of zinc rich powder coat primer was put down. The next layer was the metallic oil rubbed bronze. The final layer is a 100% gloss clear coat for added weathering properties. Make Your Driveway Entrance One-of-a-Kind! 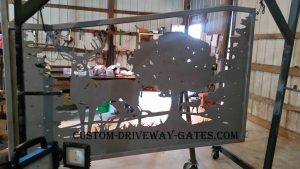 We are always looking for the next cool driveway entrance gate project to work on, let us know what you need and we can make it happen for you. 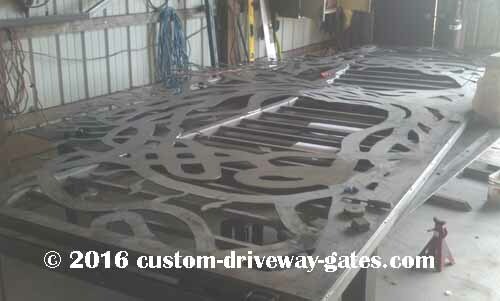 =) We build Kentucky driveway gates as well as driveway gates for our clients nationwide. Let us know about your upcoming Kentucky driveway gate project! We also install nationwide, let us give you a free quote today! Estate gates should be beautiful! 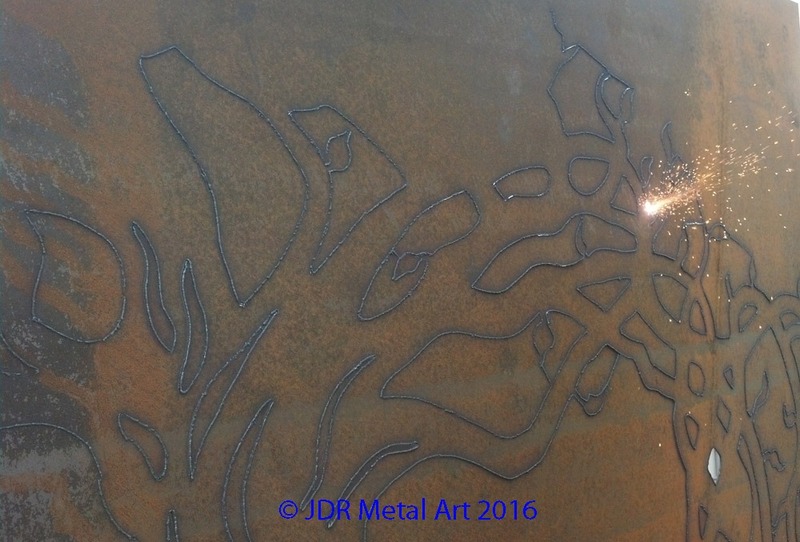 This one features an iron tree design theme built for a repeat customer with an estate located in NW Pennsylvania. It is a custom project that developed over a couple of years from the time it was conceived until we eventually built it. Our fantastic customers were wanting some ideas for a new gate design. They decided to make this one another part of their estate. 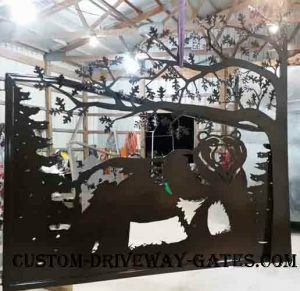 It is a 15’4″ single swing picket style gate featuring a handmade plasma cut “iron” tree design. 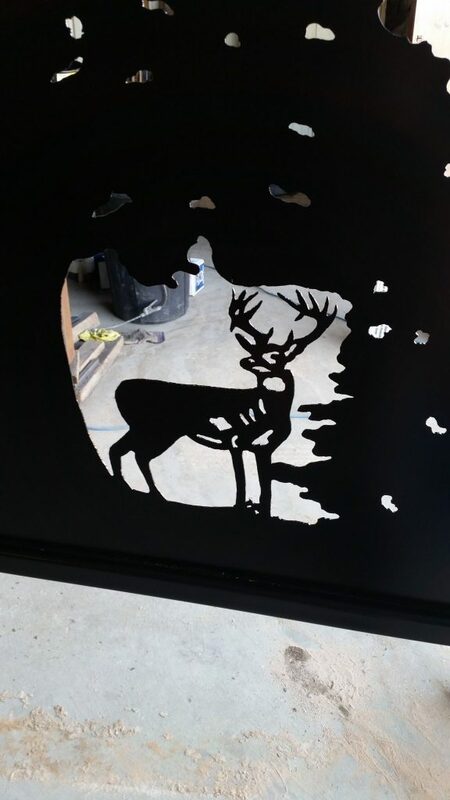 We plasma cut our custom estate gates by hand. Each and every one is different and unique! 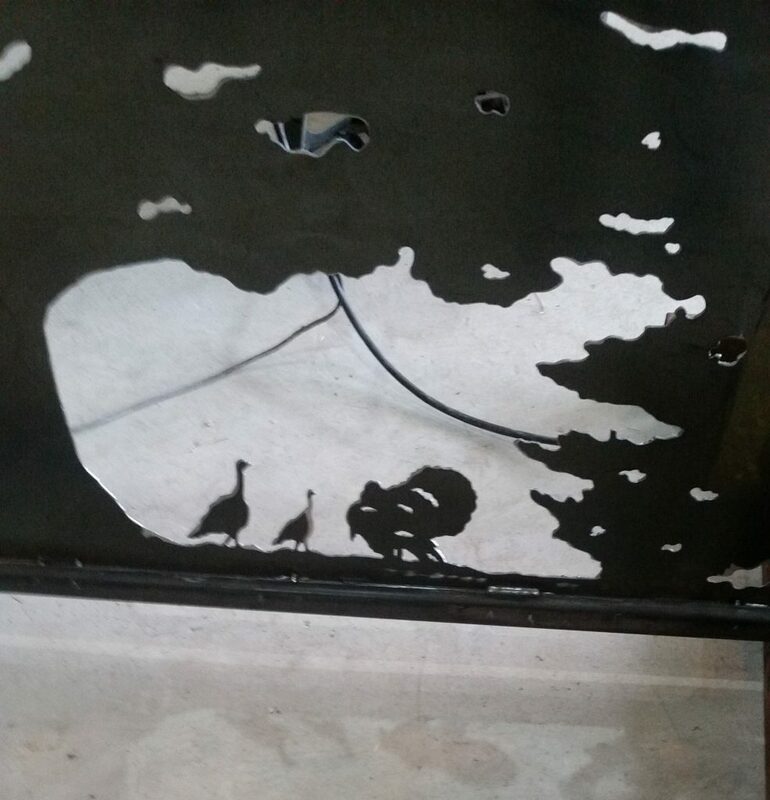 Plasma cutting is the combination of a very hot electrical arc and a stream of air which directs molten metal leaving behind a thin cut in the metal. 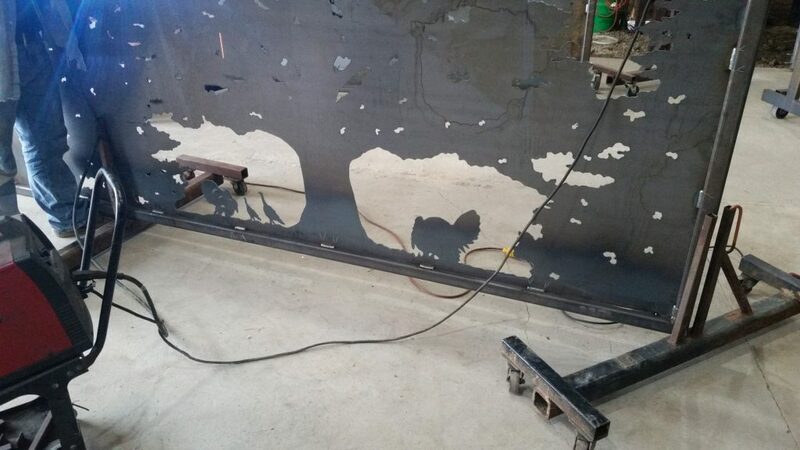 We’ve built estate gates up to 30′ long on this welding table before. And of course we can make gates even larger if you need it done! 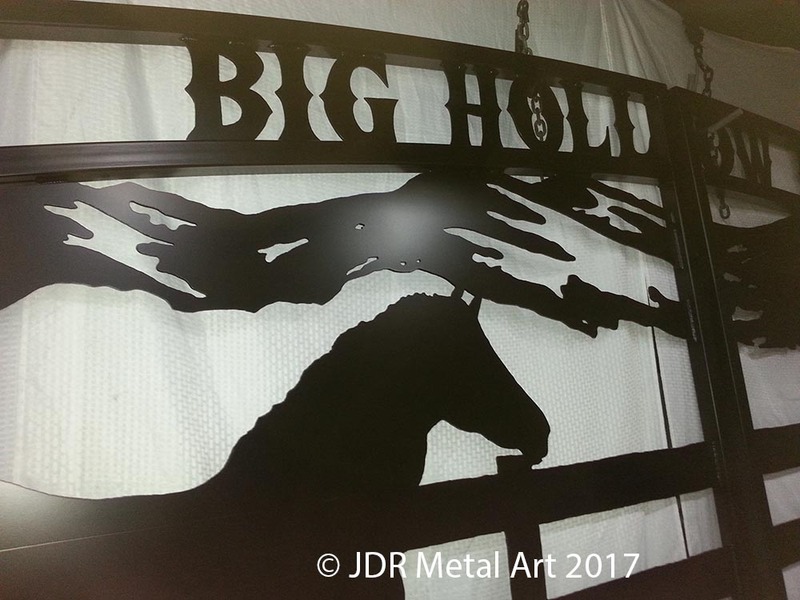 JDR Metal Art’s Estate Gates Are Built to Last! 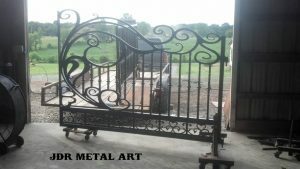 We always seek to provide our customers with an estate gate that will last for the decades to come. This one is no exception. 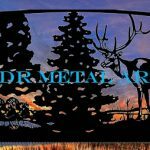 The plasma cut artwork silhouette was made from an 8′ tall and 16′ wide sheet of 3/16″ hot rolled steel. The sheet weighed just under a thousand pounds. The final weight of the estate gate was 450lbs. We made the frame to support the huge artwork silhouette from steel square tubing. 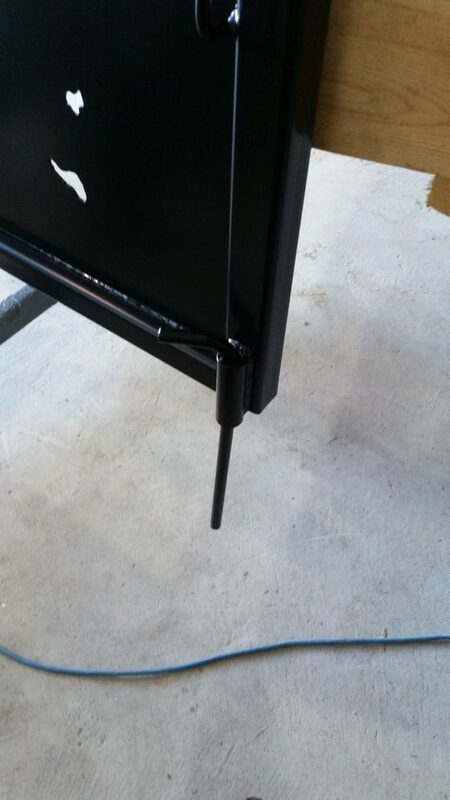 For this one we used tubing with a 3/16″ wall thickness because of the length of the gate. The 1″ square tubing used for the pickets only has a 1/8″ thick wall to help save some weight. At a finished height of 7’8″ tall this estate gate was quite a challenge to handle. Thankfully heavy equipment was available all along the way!! Being handled with a crane and forklifts without any damage is always a great test of how well our estate gates are going to withstand the forces of time. These driveway gates were coated with a three stage powder coat finish. The first coat was our typical primer; a zinc rich corrosion preventive epoxy. 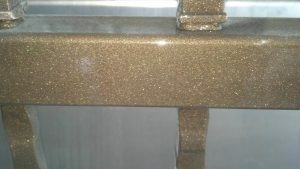 The second coat we sprayed on was our metallic oil rubbed bronze color coat. We then ran a final pass of full gloss clear coat to add weathering properties to the metallic finish. 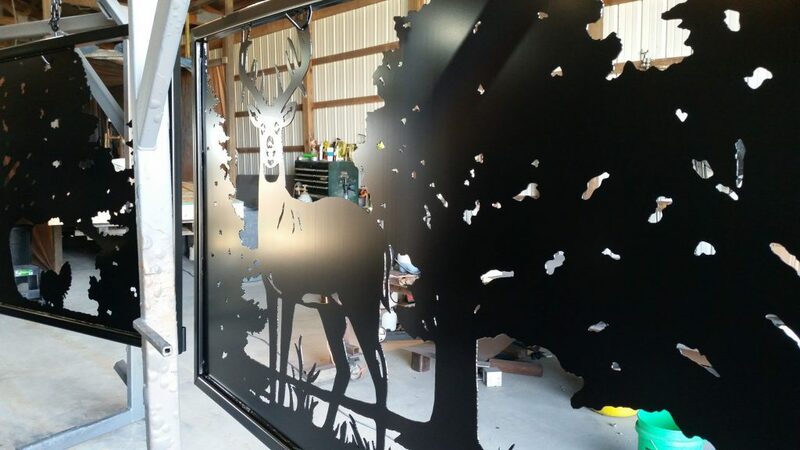 Powder coat is a protective coating we prefer to use rather than paint. 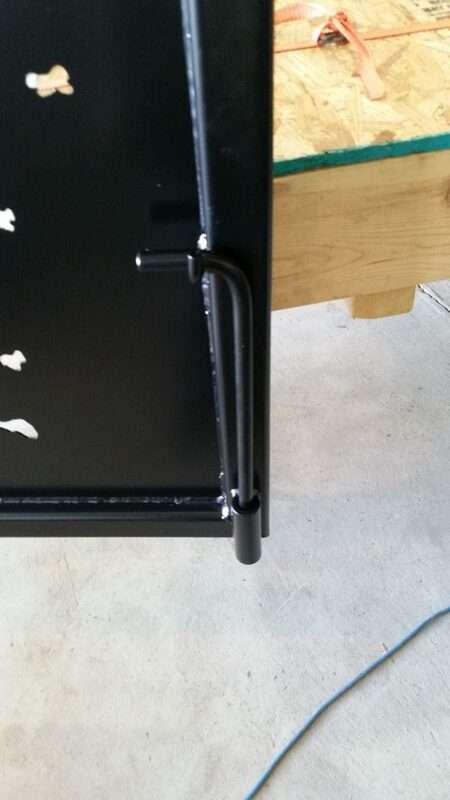 Powder coat builds substantially thicker than paint. 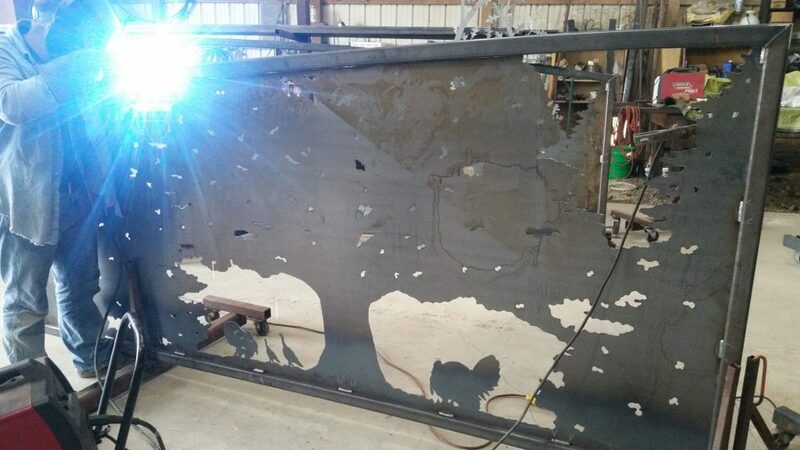 It smooths out any of the sharp edges that sometimes can develop during the gate plasma cutting process. We think that powder coat paint is much more durable than the vast majority of other paints because powder coat is so scratch and chip resistant. It will not be removable with a fingernail, unlike many paints. 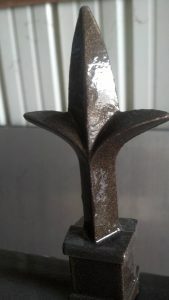 In fact, many times even a blow from a hammer will not phase the surface of a properly applied powder coat. 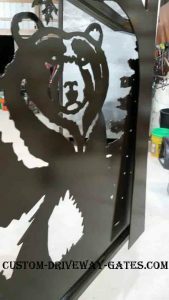 Powder coat is also much more environmentally friendly than paint because we don’t have to use any solvents to apply the powder. Air fluidizes the powder and allows it to be sprayed on uniformly. An electrical charge applied to the powder helps it to stick uniformly to the metal gate. Powder coat doesn’t take weeks to cure like paint does. Once the powder has been applied the estate gates go into a very large propane fired oven that is heated to 400 degrees. The powder coat turns into a gel at this time. Once the part has been up to temperature for 10 minutes then the oven is turned off and the gate cools down to room temperature. Once the gate has dropped to about 150 degrees the powder coat gel turns into a fully cured paint that can be handled once it cools down a bit further. 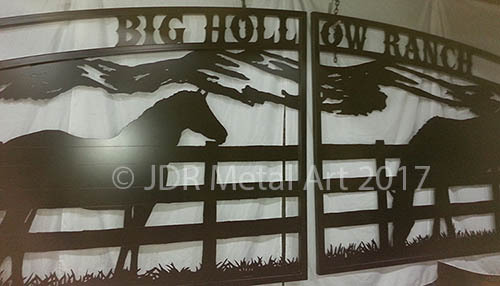 This single swing estate gate was made for one of our client’s horse pastures. 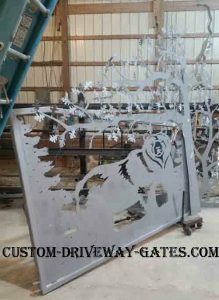 At the time we built the gate we also built a custom gate adapter plate to our customer’s specifications. Then we attached the gate to it’s supporting wood post at the installation site. In the photograph above you can see our adjustable sealed bearing hinges. They are mounted with grade 8 hardware and have a 2000lb weight capacity. Our gate is very much within that range. Our client installed the Liftmaster LA 500 series swing gate operator. 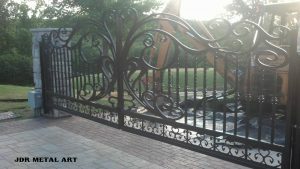 It is a commercial grade operator and a great choice because it is made especially for large estate gates such as this. Also being installed into the opener system is a dual locking device to keep strain off the gate operator during periods of high winds. The client’s estate has large hills and wind can really put a lot of resistance on larger estate gates such as this one. Remote controls give the estate owners the access they need without having to stop and get out of the tractor numerous times to open and close the gate. 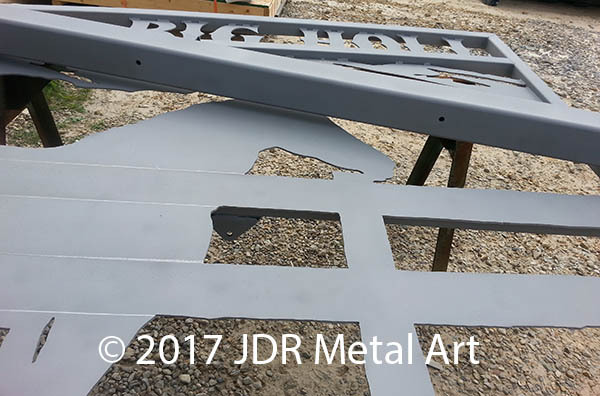 Whether you need estate driveway gates or an estate pasture gate, JDR Metal Art is ready to get started building an exciting new estate gate for you. We are proud to offer our custom gates nationwide at the most competitive prices available. Please compare us to your local gate companies! 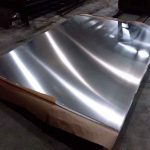 Our number 1 goal is to offer you far superior designs for a lesser cost or equal cost to that of all our quality competitors. Feel free to call or text us at one of the numbers listed on our contact us page or simply use the easy form below to get a free estate gate quote from us today!